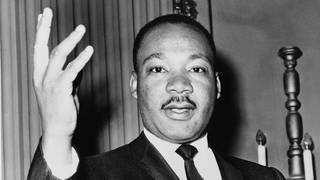 Oliver Stone on His Next Project, a Martin Luther King Jr. Biopic with Jamie Foxx | Democracy Now! three-time Academy Award-winning director, producer and screenwriter. A commemorative edition of JFK comes out next week ahead of the 50th anniversary of the assassination of President John F. Kennedy. Most recently, Stone has co-written a 10-part Showtime series called Oliver Stone’s Untold History of the United States. See all Democracy Now! interviews about Dr. Martin Luther King Jr.
AMY GOODMAN: Oliver Stone, talk about this next project that you are involved with. OLIVER STONE: Well, I’ve been writing the screenplay for the Martin Luther King story, with the cooperation of the estate. I can’t say for sure it’s going to happen. I really hope so. Jamie Foxx is very interested, and I’m—I’ve worked with Jamie before, and I think he can do a hell of a job as King. I want to tell a story about a man who was a great American, I think, right? He was in—he was our Gandhi. He was as close as I know to an American Gandhi, and a non—believed in nonviolence, but a strong nonviolent resistance. He spoke out not only for civil rights, but when he crossed over and he spoke out against militarism and greed and the Vietnam War, he made many more enemies. And he became a very strong and important character because he was merging this huge civil rights movement with the anti-Vietnam movement. He pointed out very clearly that colored soldiers were fighting in disproportionate numbers in Vietnam and killing colored people over there, whereas they could not get decent treatment or education at home. He made that famous quote, remember, about spending $320,000 to kill every single Vietnam soldier—that’s what it cost us—and we were spending $50 at home for anybody who was poor. And he was saying this is crazy, and a nation that has these priorities is doomed to a spiritual death. OLIVER STONE: Yeah, yeah, yeah. AMY GOODMAN: —in the 1963 March on Washington and then moving on to deal with LBJ to get the Voting Rights and the Civil Rights Act passed. OLIVER STONE: Right, right. Yeah, a lot—you know, and I think we have to give some—not much credit is always given to Kennedy, but his death did motivate a lot of that—that feeling that we had to pass the Civil Rights Act and then the Voting Rights Act. But King fought for it, and Johnson, that was his best side. Johnson did—we have to give him credit for backing him on that. AMY GOODMAN: —and, it looks like, on most world leaders, enemy or ally. OLIVER STONE: Well, you have to say pre-Robert Kennedy. J. Edgar Hoover of the FBI had been very interested in civil rights leaders going back to the 1930s. He bugged them. And he had been—he always thought that the civil rights movement was controlled by Moscow. And he thought the Vietnam students who were protesting against the war were controlled by Moscow. He had informants in all these groups. Hoover represents this—by the way, Hoover goes back to 1919, Woodrow Wilson era, and he was involved in the Palmer raids. He believed—that we deported many leftists in 1919. AMY GOODMAN: Including Emma Goldman and others. OLIVER STONE: Including Emma Goldman and Big Bill Haywood. It was—you know, we’ve always had a fear of communism that was disproportionate to what their real threat to us was. And before the revolution, by the way, the propertied—the propertied classes always fear labor. AMY GOODMAN: —the mass surveillance of Americans and people all over the world. AMY GOODMAN: This is under President Obama. OLIVER STONE: Absolutely. Well, this is an old issue, too. Historically, terrorists—you know, Harry Truman in 1947, the Truman Doctrine, he declared boldly on the floor of Congress that we had to invest $400 million in Greece and Turkey to defeat outside forces. He included terrorists and communists as destabilizing Greece. These are the people, by the way, who fought for the independence of Greece against the Nazis. They became terrorists right away. So, the word “terrorist” has been used very loosely to describe whatever enemy. If you read George Orwell, 1984, the government exists—it’s justified because of terrorists. There are always terrorists in the woodwork. There are—yes, there are terrorists in the world. They are vile. We should track them down, ad doc, selectively, specifically. Glenn Greenwald has been very articulate about this. You know somebody or has connections to terrorism, I think most people would back that. But when you put the whole thing out over the web and you say everybody in the world is—are potentially suspect, you’re making a different kind of world. You’re making that horrible world that George Bush described when he said, “You’re either with us, or you’re against us.” I don’t want to live in that world. AMY GOODMAN: But either way, you’re being surveilled. OLIVER STONE: Eigher way, yeah. You have to prove you’re innocent, so to speak. AMY GOODMAN: Would it be very different? As Ari Fleischman [ sic ] said, the spokesperson for President Bush, that President Obama—as Ali Fleischer says, the former spokesperson for President George W. Bush, President Obama is a continuation of what President Bush was doing. OLIVER STONE: Obama doesn’t have—you know, what I said about vision earlier, about Roosevelt and Kennedy and Wallace, these are bigger men. I mean, I don’t think Obama was given a mandate in 2008. He could have done something. He could have been a Roosevelt. People were comparing him to Roosevelt at that time. He didn’t run with it. He hired—as Peter said, he put Clinton in, and he put Gates in, the economic team from Rubin. I don’t get it. Why didn’t he take his moment? He blew it. And by doing that, because so many young people, so many people campaigned for him, and he disbanded that organization—that was a grassroots organization he disbanded—he took the hope away from those people who believed that democracy was still possible. You call the show Democracy Now! I was thinking about that. That should be a question mark. You know, you have an exclamation point. AMY GOODMAN: Would you consider making a film about Edward Snowden? OLIVER STONE: I think he’d be a terrific subject. Frankly, I don’t know that I can handle it, because there’s so much incoming news. I think Snowden had been very smart, and he’s done the best he can under most difficult circumstances. AMY GOODMAN: Well, Oliver Stone, I want to thank you very much for being with us. We’re going to continue this conversation after the broadcast, and we’ll post it at democracynow.org. This is—this month is the 50th anniversary of the assassination of Dr. King [ sic ]. Oliver Stone and Peter Kuznick—of Martin Luther—of John F. Kennedy. AMY GOODMAN: That’s right, 50th anniversary of the March on Washington. OLIVER STONE: And Robert Kennedy was killed a few months later. AMY GOODMAN: The Untold History of the United States is Oliver Stone and Peter Kuznick’s collaboration, both the book and the multi-part Showtime series, now available on DVD.